Vanity Fair chronicles the lives of two women who could not be more different: Becky Sharp, an orphan whose only resources are her vast ambitions, her native wit, and her loose morals; and her schoolmate Amelia Sedley, a typically naive Victorian heroine, the pampered daughter of a wealthy family. Becky's fluctuating fortunes eventually bring her to an affair with Amelia's dissolute husband; when he is killed at Waterloo, Amelia and her child are left penniless, while Becky and her husband Rawdon Crawley rise in the world, managing to lead a high life in London solely on the basis of their shrewdness. Ah, the novel without a hero! I really enjoyed this. Thackeray's voice is absolutely wonderful, so much so that I am tempted to say that he was my favourite character of them all. There is something so cheeky about a storyteller who will pause his narrative to express an opinion or make an ironic remark. His satire is so delicious, his personal commentaries hilarious, and his insights incredibly thought-provoking. To begin with I believed this story to be the typical nineteenth century tale of love, marriage, war, death, betrayal and social status. Although it was all of these things, it differs hugely from other novels from this time with the same themes. I couldn't help but wonder how different the novel would have been if it had been written by Austen. Thackeray gives us so much of his opinion on class, a woman's role, wealth, war, morals, and social status. His little asides really are what makes the novel brilliant. My edition of this book is a Wordsworth Classic, which comes with footnotes to help us understand some of Thackeray's points, particularly his symbols. I found these to be incredibly helpful, particularly when I came across biblical and mythological references. There are also various sentences written in French, possibly a romantic symbol, which are translated in the footnotes also. I really would recommend obtaining a copy with footnotes, as I found them absolutely fascinating and they allowed me to learn some very exciting things. Thackeray's characters were excellent to begin with, and I was excited to see where they'd end up. As the novel progressed, however, they all began to irk me. I'm not sure whether this was due to characterisation, or just that I felt the issues which were making them all tick were unfathomable and pathetic. However, this is Vanity Fair and Thackeray was often on hand to break his narrative in order to assure me they were in fact being completely and utterly ostentatious for no good reason. 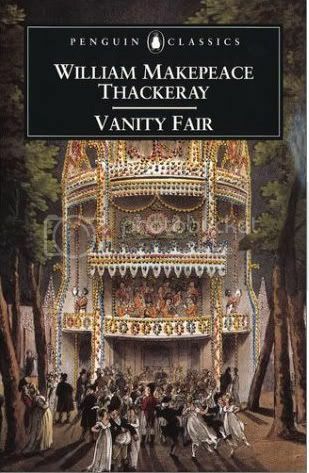 Main characters aside, Thackeray must have mentioned each and every high class citizen by name, advised to whom they were descended from, gave a little bit of background knowledge on some of their sins and vanities, only to never mention them again. Or if they did drift back into the plot at some point, I would have forgotten all about them since meeting so many more of their compatriots. My eyes literally glazed over in these pages of family trees. They added nothing to the plot, and more often than not I felt the need to put the book down for a while. If Thackeray is to be commended for anything in this novel, it would be his attention to detail when describing the events that transpired during Waterloo. It's clear he researched every tiny detail perfectly. War jargon goes completely over my head, and my eyes would glaze over again when Thackeray was talking military; however his descriptions of the day of the Waterloo battle were perfect, and evoked the proper emotions in me. My favourite aspect of the novel was Thackeray showing us that love can simply erode when confronted with wealth, or social class. The measures his characters took to ensure they had plenty of money, respect and status, were absolutely unreal. They were so selfish, immoral and had their priorities all wrong. He also showed us pure love, but this was also given away for money and class. Very, very thought-provoking. I could probably sit here and write an entire critical essay on this novel, and ramble on about the satire, irony, symbolism, characterisation and narrative, however I have been reading this book for over a month and I'm now quite pleased I'm casting it off. I would absolutely recommend this as a long haul effort of a novel, an absolute eye-opener.